This Bluetooth keyboard case is very easy to set-up right out of the box. The iPad slides into a windowed sleeve on one side and is held in place by a flap. The outer shell protects the iPad mini nicely with a thin but hard scratch resistant synthetic leather surface. In the three weeks I’ve used the Kensington Keyfolio Keyboard Case for iPad mini, and I used it pretty roughly, surprisingly it did not get any scuffs. One of the keys did break off the keypad. The inside of the case is covered in a very soft plush black velvet. The velvet is used for sticking the velcro tabs on the windowed sleeve when using the iPad mini as a laptop. I’m glad that Kensington left openings for both the front and back cameras. One thing I did not like but is not really Kensington’s fault (rather an issue created by the size of the iPad mini) is when using the iPad like a laptop (as in the above picture), I could not arrange the screen for comfortable viewing. This is a minor issue that is easily fixed by removing the keyboard from it’s magnetic attachment and shifting the “screen” to a desirable angle. Battery life was very good. The first full charge lasted nearly two weeks of 7-10 hours of daily use. Kensington says the battery should last three years. I also used the keyboard with an AppleTV. 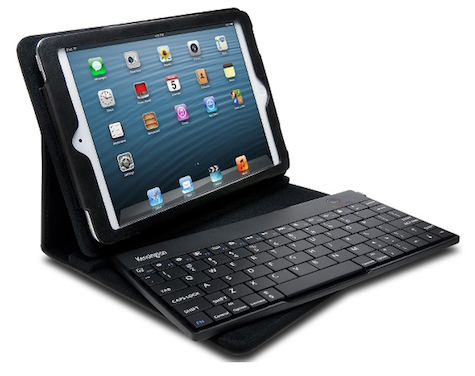 The Kensington Keyfolio Keyboard Case for iPad mini is very lightweight overall and its compact design is ideal for travel. The small size of the keyboard could pose an issue if you are used to a standard size keyboard. That said, it’s a big step up from Apple’s “on-screen” keys. Please see the product web page, linked above, for features and specifications. MyMac Review Rating is 7 out of 10, with a recommendation.